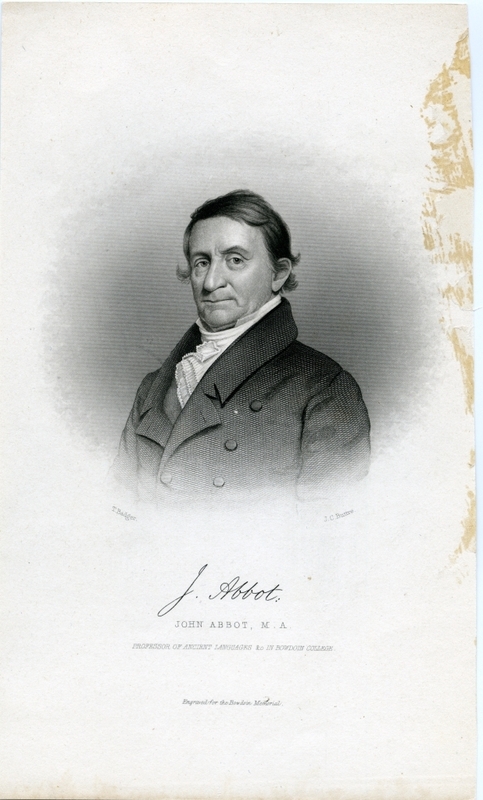 Portrait of John Abbot, Bowdoin Professor of Ancient Languages and Classical Literature (1802-1816) and Bowdoin College Librarian (1802-1824). "Engraved for the Bowdoin Memorial", which refers to the "History of Bowdoin College with Biographical Sketches of its Graduates, from 1806 to 1879, Inclusive" by Nehemiah Cleaveland, edited and completed by Alpheus Spring Packard, Boston: J.R. Osgood & Co., 1882. Badger, T. and Buttre, J.C.